Yes, this review had a lot of complaining, we will always have strong opinions about something that we love dearly, and Gilmore Girls definitely fits into that category. It was a show that was difficult to watch at times, but was endearing in the end. And will whole-heartedly say that if your were a Gilmore Girls fan you should definitely watch A Day in the Life, it’s a lot better that season 6 and 7. If not just for the nostalgia of it all, it felt like coming home to see Stars Hollow unchanged as just characters got older. There was Mrs. Kim with her Korean choir, Jackson selling vegetables, Andrew complaining about something, Gypsy fixing cars, Taylor making announcements, Babette and Miss Patty gossiping. It was quintessentially what Stars Hollow was all about, and the best part of it was that the actors slipped beautifully into their roles, it did not feel rigid and new at all, it felt like we were just dropping in on ordinary days in Stars Hollow. The development of the characters and especially the growth and closure for Emily and Lorelai was excellent – around Richard’s death, Emily’s aging, and Lorelai’s business and marriage. These areas of their lives were tackled so well, and it gave both characters a sense of peacefulness and closure that the original series did not give us. Most of my problems with A Day in the Life was from the Rory storylines. I understand the importance of describing the career difficulties that Rory faces, most of us in that age group understands what it likes to fail at various career paths that you were previously believed was your calling, but this could have done a lot better and swifter. A lot of sequences in the episodes were too long – such as the subplot of the musical – if the whole musical was for Lorelai to hear the meaningful song that Sutton Foster sang, they could have just precluded it with one of the previous musical items. The Life and Death Brigade sequence too went on for ages. But through all of this – the baby saga included – my biggest criticism was that there was not enough Paris Geller. Paris was by far the best character of the original series, and the first episode reminded us why as she is the fertility doctor that Luke and Lorelai consult with. While I am a fan of How To Get Away With Murder as well, and Liza Weil is great in there as well, Paris is the role she was born to play. The way she nuances Paris’ dramatics with her heavy moments and comedy is a work of art. When we meet Paris, she is divorced from Doyle (who is now a screenwriter), and she has two kids. We never get to learn what becomes of their relationship. Where is my Paris closure though? She isn’t even in the last two episodes. Paris outrage aside, A Year in the Life was a gift, a present from the television gods, a last chance to say goodbye to our favorite characters, to reunite with our childhood heroes and to tell one final story. It’s amazing that Netflix can bring together all the original actors (even Melissa McCarthy) for one extravaganza no matter the outcome. 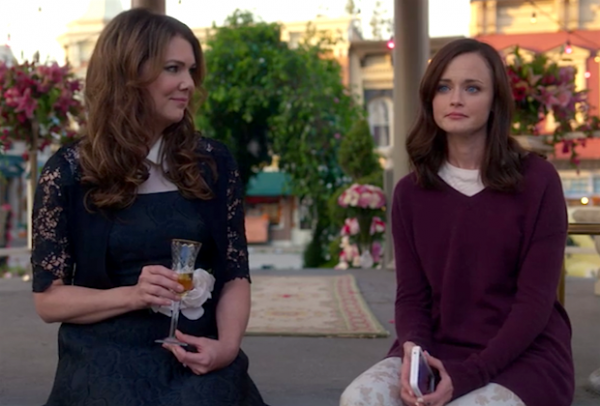 What did you think of Gilmore Girls: A Year in the Life?